ORLANDO, Florida, April 22, 2015 (ENS) – The 2015 Tesla Model S P85D, a premium electric car, earned the top score in the 2015 AAA Green Car Guide, the American Automobile Association announced Tuesday. Based in Palo Alto, California, the automaker also claimed the top spot in last year’s guide. To help drivers in the market for a green car or truck, the fifth annual AAA guide reviews 88 vehicles – those powered entirely by batteries, some hybrids, vehicles that run on compressed natural gas or diesel, partial zero emission vehicles, and gasoline-powered vehicles with high fuel economy. The 88 vehicles were tested and scored by the Automobile Club of Southern California’s Automotive Research Center in 13 categories, such as braking, fuel economy, emissions, handling and ride comfort. 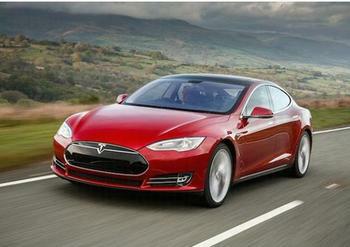 The five-seat, all-wheel drive, 691 horsepower Tesla P85D goes from zero to 60 in 3.5 seconds. It comes equipped with an autopilot system, automatic cruise control, and lane departure warning with steering assist. Even at a price of $120,000, the Tesla P85D is cheaper than most other luxury performance cars. The Green Car Best Value award went to the 2014 Nissan Versa SV. “It’s priced under $17,000, averages about 35 miles per gallon and has a spacious interior making it an affordable fuel-sipping car,” said McKernan. The 2015 AAA Green Car Guide contains comprehensive information about green technologies from the Automotive Research Center evaluators. The research center tracks significant changes to a vehicle from model year to model year. If no significant changes were made to the power train in 2015, a prior model year’s results were used. For example, staff tested a 2014 Mazda3 sedan. No significant changes were made to its powertrain in 2015, so the 2014 results were included in the 2015 AAA Green Car Guide. The Automotive Research Center’s engineers and technicians – who have more than 100 years combined experience – evaluated the vehicles. Each of the 13 categories was scored on 0-10 points. Scores were totaled to determine top vehicles. Then, each vehicle’s total score was divided by its “as-tested” price to determine its cost per point for best value. The guide lists vehicle specifications, test scores, data and observations in one-page summaries. Tested vehicles were selected based on emission certifications from the California Air Resources Board and U.S. Environmental Protection Agency’s fuel economy ratings. Tests were performed at the Auto Club Speedway in Fontana and on Southern California roads. Testing procedures were developed by the Society of Automotive Engineers, the U.S. EPA and AAA. Download the Guide and find out more at: www.AAA.com/greencar. As North America’s largest motoring and leisure travel organization, AAA provides more than 55 million members with travel, insurance, financial and automotive-related services.